As barbecue continues to evolve from a rural southern cooking tradition into a global cuisine, more attention has and needs to be paid to its origin and definition. Purists seeking authenticity find themselves hampered by a confused and often false history of the development of barbecue linking its roots to the early colonial Americas. 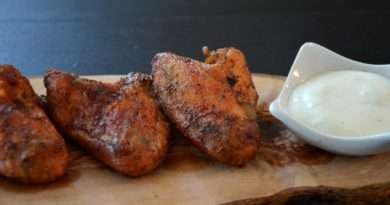 As television cooking shows and a wealth of information, recipes, and methods available on the internet draw increasingly divergent participants to barbecue, the arguments once relegated to backwoods barbecue joints are now being taken up on the patios of the Netherlands and emerging restaurants of Western Australia. To say that barbecue owes its origins to a primeval fire 250,000 years ago is a tautology. All cooking originates with that fire, so this is as interesting as saying that the first cooking fire is the origin of cupcakes. Saying that the discovery of fire led to barbecue fails to differentiate it from shish kebab, luau, or cake baking. Fire is the first technology, cooking the first technique, and smoke the first flavoring. For the vast majority of cooking history, live fire was the only method, and everything tasted of char and smoke. This definition of barbecue places virtually all cooking under its umbrella and is too broad to be of consequence. After World War II, as Americans migrated from the front porch to the back patio, barbecue became synonymous with any kind of outdoor cooking. Barbecue simply meant, and largely means today, a meal prepared out of doors, the food served at that meal, a cooking apparatus for its preparation, or a gathering to enjoy it. This gives us the accurate but distasteful ability to say that one attended a “barbecue to consume barbecue, barbecued on a barbecue.” We have tamed and contained the campfire, cleaned it up, and made it as reliable and predictable as our microwaves. Calling this barbecue, globally the most recognized definition, is again too broad. In the lexicon of the Southern United States, barbecue is typically defined as tough cuts of pork or beef, slow cooked at a low temperature in a smoky environment. Low, slow, and smoke are referred to as the three legs of traditional barbecue. This style of cooking and its flavor profile developed from multiple sources eventually joining together from divergent traditions to become the food that is ordered in restaurants around the world under the banner of barbecue. Finding a single recipe for barbecue is an impossibility since it is a culinary tradition, not a specific menu item, or even a collection of dishes. The stereotypical barbecue restaurant may serve brisket, pulled pork, pork ribs, and chicken, but here the similarities differ. 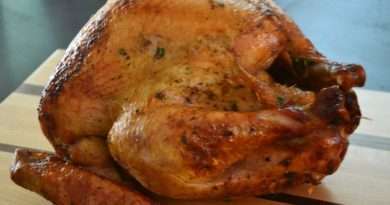 Flavor profiles, sauces (or lack of), side dishes, and presentation will all vary based on the location and specific tradition being followed. Attempting to trace the root of the word barbecue is as problematic as trying to define its specific flavor. 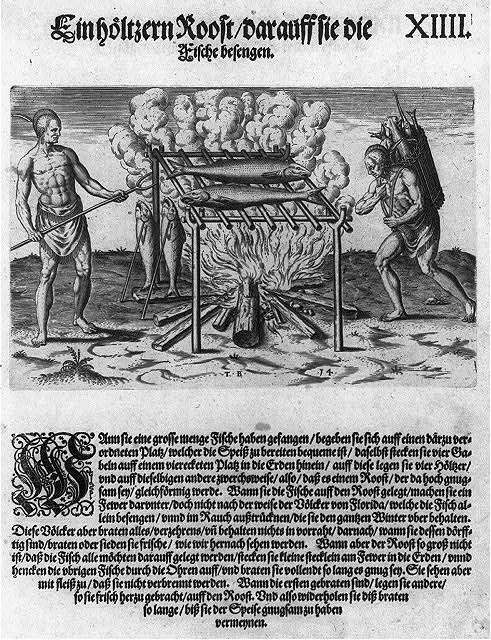 Most etymologists today agree that the origin of the word barbecue comes from barbacoa, as used in many of the Caribbean dialects (Taino in this case) meaning “sacred fire pit.” However, it can also be claimed that the Spanish word Barbacoa comes from the indigenous Haitian word, barbakoa, meaning a framework of sticks. Or it could have come from the Isthmus of Panama where the word was first recorded in print. Historian Andrew Warnes in his book Savage Barbecue, shows that throughout the Caribbean region the word barbacoa does in fact mean a structure of sticks producing a raised platform on which one could sleep, store grains above the ground, or cook. Because this framework is wooden, it would have to be constructed in such a way that the fire didn’t get near enough to the sticks to cause the wood to combust. This would create a slow cooking method with a heavy dose of smoke (which also repelled insects), and might be one of the reasons why this method of cooking became connected with modern barbecue. But how does this differ from live fire cooking used around the world? Though largely disputed, one popular origin story includes the French term barbe-à-queue meaning from “beard to tale,“ and refers to a medieval European method for cooking a whole goat on a spit or wooden structure over a live fire. The Anglo contraction of barbe-à-queue is barbeque. Note the “e” in the middle of the word where barbacoa has an “a.” It should be noted that this origin has been too hastily dismissed, if for no other reason than that most dictionaries published in America and Europe during the 18th and 19th centuries listed it as the actual origin of the modern word barbecue. It is also important to note that barbecue has, for the last several centuries had spelling variants like bar-b-q, bar-be-que, bar-b-que, bar-b-cue, bar-be-cue, barbicue, or barbacue. The French had strong influences in the Americas during early centuries after their arrival in both the Quebec region of Canada as well as the Caribbean. Many of the northern Acadians migrated to the Louisiana area and became the Cajuns. These peoples brought with them their cooking techniques and language. In the French Caribbean colonies, these techniques were adopted by African slave populations in conjunction with their own traditions. Many of these individuals were sold within the Caribbean colonies or purchased and sent to the continental mainland. The similarity between barbecue and barbaric has also been noted by historians and etymologists. 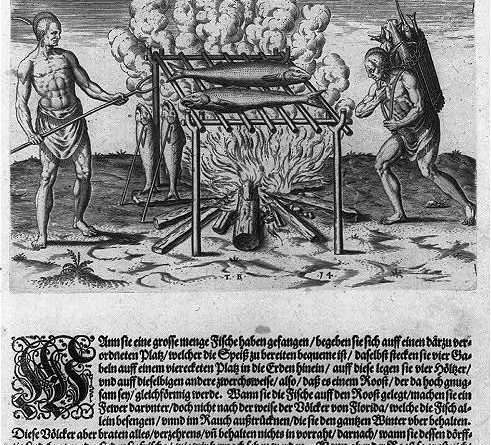 One story of the origin of barbecue comes from a now extinct tribe who lived in the region of modern Guyana (a place where the wooden barbacoa frame was also used) known for spit roasting their captured enemies, hence barbecuing them. 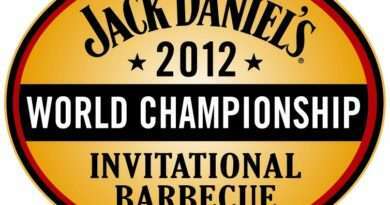 The association of barbecue as a barbaric method of cooking or even execution starts in the later part of the 17th century with illustrations of cannibalistic cookouts and stretches to the 20th century with Peter Pan, author J. M. Barrie, giving fictional pirate Long John Silver the nickname Barbecue, as in, he barbecued his victims. It can also be noted that term buccaneer, from French boucanier, literally translated as “user of a boucan,” a Haitian native style wood frame grill used for cooking meats, particularly manatee. The buccaneers started out as a group of runaway indentured servants who fled to the then abandoned island of Hispaniola (now Haiti and The Dominican Republic). Cattle had been introduced to the island a century before and their population had grown dramatically. These “buccaneers” smoked strips of meat in a process similar to making beef jerky and tanned hides which they traded with passing ships. They ultimately turned to piracy, creating many of the pirate legends today. Perhaps it is this story that inspired Barrie to connect barbecue with pirates, or simply the European belief that barbecue was a barbaric method of cooking. Etymologists trace the origin of a word from the origins and meanings of its root parts. If barbacoa does in fact mean “sacred fire pit” then the connection seems evident. If, however, this definition is a later attribution, then barbacoa may in fact, not be the source of the modern term barbecue. Ultimately, the origin of the word and its definition is inextricably linked to the evolution of the method of cooking. Obviously, the indigenous peoples of the Caribbean region did not smoke pork ribs. The fish and iguana seen slow roasting on wooden frames in early illustrations were either grilled or made into a kind of jerky. Barbecue as we understand it today was probably not their goal. Barbe-à-queue is, by definition, a method of whole animal cooking, and the mainstay of early barbecue. The 1828 Webster Dictionary differentiates between the barbecue of the West Indies, where it was whole hog, and the barbecue of the United States, which was typically Oxen. Similarly, dictionaries in England refer to barbecue as the cooking over a live fire of a whole animal. References to barbecue in the 17th and 18th centuries universally refer to the live fire cooking of whole animals. In a 1707 pamphlet, Edward Ward described the roasting of three pigs, “broiled under an apple tree” in Peckham, Jamaica. Again the details are short but he tells us that these hogs were cooked in the “West Indian manner,” meaning with the heads and tails on. It might be too much to assume that barbecue migrated directly from the Caribbean into the southern colonies, but a strong argument can be made for it. There is, however, another predominant path that starts in Latin America and ends in central Texas. This might be the path of barbacoa, after all, it is a Spanish word. In the days before Sam Houston and for decades afterwards it was common for Mexican cowboys to hold a barbecue on cattle drives which consisted of slow roasting the head of a cow over a live fire. Today in Mexico, barbacoa refers to the slow cooking of meats, particularly whole sheep over an open fire or more authentically, in a covered pit. There is no simple way to reconcile these apparent contradictory lineages. Like all things American, barbecue is a fusion of multiple cultural traditions combining with the events that built the nation. The hogs brought by DeSoto and the emergence of the massive cattle industry provided an abundance of available meat, particularly the undesirable cuts that barbecue is so good at turning into a tender and flavorful finished product. The waves of immigration, voluntary and forced, provided the cultural influences that adapted cooking styles, innovated sauces and seasonings, and produced new ways for adding smoky flavors. Similarly, the word has evolved from multiple understandings of barbecue over the course of the past 400 years. Barbecue is a culinary tradition that emerged from a multi-ethnic America. As distinctly American as jazz and equally capable of universal appeal, it will continue to evolve and grow as it spreads around the world. Of course, there will be arguments of authenticity and origin, but these are largely academic. Like any cuisine, barbecue is a living thing and it will change to adapt to ingredients, techniques, flavors, and location as it grows. Barbecue is more than just smoked meats; it is a combination of flavors, accompanying side dishes, and presentation, but more importantly it is a tradition.